Many patients can lose their teeth due to trauma, tooth decay, gum disease, or an impacted tooth. Lost teeth can throw off your teeth’s alignment so that they do not distribute pressure as well and they may become worn down. In addition, your other teeth can begin to drift into the space causing them to become crooked. Because of these problems, you should consider finding a restorative option for your lost tooth or teeth that is the best fit for you and that protects your other teeth. Dental implants—Implants are posts inserted into your jaw. They can replace the roots of your teeth, which means that your jawbone will continue to receive nutrients. They are generally topped with an abutment piece, and then another restoration, such as a crown or bridge. Implants can help stabilize the prosthetic placed on top and protect the health of your jaw at the same time. Dental Crowns—Crowns can be placed over a tooth to stabilize it after it has been cracked, protect it after a root canal treatment, or preserve it after some other kind of trauma or damage. Crowns can anchor a dental bridge in place, so that it does not move around. However, crowns can also be placed on top of an implant as a restorative option to replace the visible portion of your tooth. 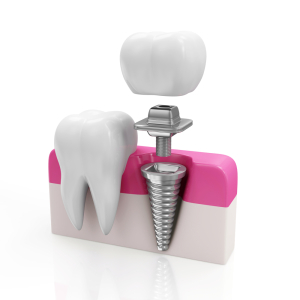 The implant should hold them in place so that they remain stable. Dental Bridge—Bridges can replace several lost teeth in a row, and they can be supported by the two teeth surrounding the gap or by receptor sites placed in your gums. These restorations can look like your natural teeth, as they are crafted specially for you.